Compounds isolated from leaves, bark, skin and seed are used in traditional Indian medicine. Latest studies suggest that these compounds may prevent development of diabetes and decrease high blood cholesterol level. Mangoes are juicy stone fruit belonging to the genus Mangifera, consisting of numerous tropical fruiting trees, cultivated mostly for edible fruit. Oils isolated from the leaves and tree sap may produce contact dermatitis in sensitive individuals. The mango is native to the South Asian areas of Eastern India, Burma and the Andaman Islands, from where it has been distributed worldwide to become one of the most cultivated fruits in the tropics. Mango juice can be used as a marinade because it softens the texture of the meat. There are over 400 mango varieties. Mango can survive couple of hundred years in the wild. Mango trees grow to 35–40 meters (115–131 feet) tall, with a crown radius of 10 meters (33 feet). But mangoes in cultivation are generally pruned and kept much smaller for a more manageable harvest. Mango can be consumed raw or in the form of juices, ice creams, milkshakes and different types of salty and sweet dishes. The leaves are evergreen, alternate, simple, 15–35 cm (5.9–13.8 in) long, and 6–16 cm (2.4–6.3 in) broad; when the leaves are young they are orange-pink, rapidly changing to a dark, glossy red, then dark green as they mature. Mango is rich source of potassium, vitamin C and A. It also contains high amount of dietary fibers which facilitate digestion. The flowers are produced in terminal panicles 10–40 cm (3.9–15.7 in) long; each flower is small and white with five petals 5–10 mm (0.20–0.39 in) long, with a mild, sweet odor suggestive of lily of the valley. India is the greatest producer of mango in the world. 60% of globally consumed mango originates from India. Once the flowers are pollinated, it takes anywhere from three to six months for the mango fruit to develop, depending on the variety. The ripe fruit varies in size and color. It can be yellow, orange, red and green. Mango becomes fully ripe after three to six months. Commercially available mango is harvested green to prevent rotting of the fruit on its way to the supermarkets around the world. Ripe, unpeeled mangoes give off a distinctive resinous, sweet smell. In general, mangoes grown commercially are picked when mature but not fully ripe, so that they survive being shipped to market intact. Edible part of the fruit consists of orange flesh that surrounds large flat, oblong pit that can be fibrous or hairy on the surface. Mango tree starts to produce fruit after four years. Some trees produce fruit even after 300 years. Inside the pit 1–2 mm (0.039–0.079 in) thick is a thin lining covering a single seed, 4–7 cm (1.6–2.8 in) long. The seed contains the plant embryo. Mangoes have recalcitrant seeds – they do not survive freezing and drying. Mango develops egg- or kidney-shaped fruit covered with smooth skin. Size of the fruit and color of the skin depends on the variety. Most commercially available mango varieties have reddish-green skin. Edible part of the fruit consists of orange flesh that surrounds large seed, located centrally. Mangoes are generally sweet, although the taste and texture of the flesh varies across cultivars; some have a soft, pulpy texture similar to an overripe plum, while others are firmer, like a cantaloupe or avocado, and some may have a fibrous texture. Some types of mangoes that can be found at specialty markets seasonally include the Ataulfo, Francis, Haden, Keitt and Kent. The Tommy Atkins mango is the most commonly grown mango in the United States. It is a large mango that is notable for its dark red skin, sometimes covered in green and yellow accents. Mango is called the king of fruits not just for its taste and super flashy yellow color, but also for the array of health benefits it offers. Flowers of mango are pollinated by wind or by insects such as different types of flies, moths and butterflies. Mango develops small, white or pink flowers that consist of 5 petals. Individual flowers are part of branched inflorescence. Mangoes contain over 20 different vitamins and minerals, most notably vitamin C, vitamin A, folate, fiber, vitamin B6, and copper. Mangoes fight cancer, alkalize the body, aid in weight loss, regulate diabetes, help digestion and clean your skin. One cup (220 grams) of mangoes is just 100 calories, so it’s a satisfyingly sweet treat. Mangoes are widely used in cuisine. Mango has strong root that grows 20 feet deep into the ground. Root is designed to absorb water and nutrients from the well drained sandy soils. Sour, unripe mangoes are used in chutneys, athanu, pickles, side dishes, or may be eaten raw with salt, chili, or soy sauce. Ripe mangoes are used to make curries. Mango lassi is popular throughout South Asia, prepared by mixing ripe mangoes or mango pulp with buttermilk and sugar. The pulp from ripe mangoes is used to make jam called mangada. In many Latin and some Asian countries, mango on a stick with the skin peeled back is sold by street vendors. Mango has narrow, leathery leaves. They are dark green in color and alternately arranged on the branches. In April 2014, a pair of mangoes sold for a record 300,000 yen ($2.600). The two mangoes were sold under the Taiyo no Tamago label, which translates as “Egg of the Sun”. The label is famous for its rigorous criteria, including a minimum weight and a high sugar content. The heaviest mango weighed 3.435 kg (7.57 lb) and was presented by Sergio and Maria Socorro Bodiongan (Philippines) at the Sundayag Celebration’s Pinaka Contest in Cagayan de Oro City, Philippines, on 27 August 2009. Mango tree is tall, evergreen plant that can reach 115 to 130 feet in height. Its crown has a diameter of 33 feet. Around the 5th century B.C., Buddhist monks are believed to have introduced the mango to Malaysia and eastern Asia – legend has it that Buddha found tranquility and meditated under the cool shade of a mango tree. Persian traders took the mango into the middle east and Africa, from there the Portuguese brought it to Brazil and the West Indies. Mango cultivars arrived in Florida in the 1830’s and in California in the 1880’s. Nearly half of the world’s mangoes are produced in India, but the country accounts for less than one percent of the international mango trade due to the fact India consumes most of its own. 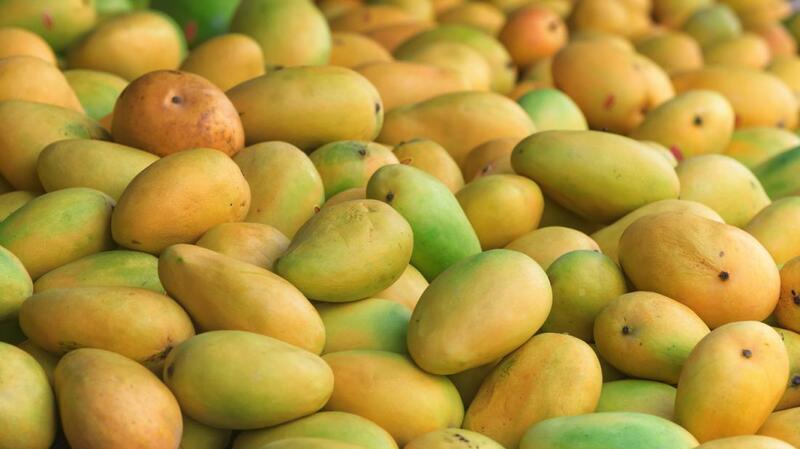 Apart from India, other major producers of mango are China, Mexico, Thailand, Indonesia, Pakistan, Philippines, Nigeria, Brazil, Peru, Australia, South Africa, Malaysia and Venezuela. The mango is the national fruit of India, Pakistan, and the Philippines. It is also the national tree of Bangladesh. In Hinduism, the perfectly ripe mango is often held by Lord Ganesha as a symbol of attainment, regarding the devotees’ potential perfection.